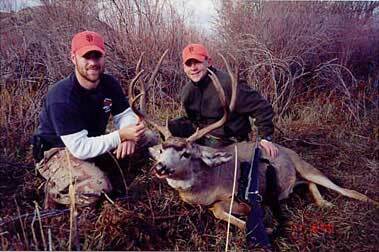 Larry Pasero Jr. (left) and Rich Jones show off Larry's excellent Colorado mule deer buck. Photo taken by Larry's father. The 2000 season trip was the 5th for my dad and I, and the first for my hunting pal Rich Jones. I found this buck on the second-to-last day after glassing and passing on at least 10 other bucks. This was the best by far and I'm glad I waited. Early that morning we went to a favorite lookout where a group of deer had been spotted the day before by a few others in our group. The location by the river often holds a good group of does. The rut was just kicking in and I had the feeling that the bigger bucks were moving in to bump out the smaller ones. I crept out to the point and glassed a nice three-pointer that had 11 does with him. Dad circled around to another point on my left. All of a sudden, deer broke from our left and I was sure that Dad had jumped some does and the gig was up. The plot quickly unfolded as this large-bodied, dark horn buck pushed two more does back to the group and chased off the three-point. It didn't take me a second to figure out he was a shooter. I quickly got my .300 Weatherby on my shooting stix. I had to wait for what seemed like forever (two minutes) for him to get done thrashing some willows and to clear himself from some does. I missed clean on the first shot and quickly rechambered. Deer were bouncing all over at the sound of the shot but they seemed unaware of where it had come from  I was 298 yards away elevated on a plateau. I settled down and put him down with a well-placed second shot. He's 22 inches wide by 24 inches tall and is a 4x4 with a worn-down inside cheater and double eye guards. Rich and I had a great time pulling his heavy body back to the truck. On this trip we saw more deer in better shape than any of our previous hunts! We can't wait to try our luck again this year!! Thanks for the great site! Keep up the good work.